The wine world can seem a little sleepy in January, so we wanted to throw a bit of a party to get everyone out of the house and back together to enjoy a little food and a few glasses. We are pretty damn excited that Marco Buratti has agreed to come and join us here in London for the first time to get the party started. The wines Marco makes from just a few hectares of vines planted over volcanic soils in the Veneto’s Colli Euganei are some of the purest, most vibrant and straight up delicious we have ever tried and he is a seriously interesting guy, having travelled the world working as both a winemaker and chef before returning home to start the Azienda Agricola Farnea. 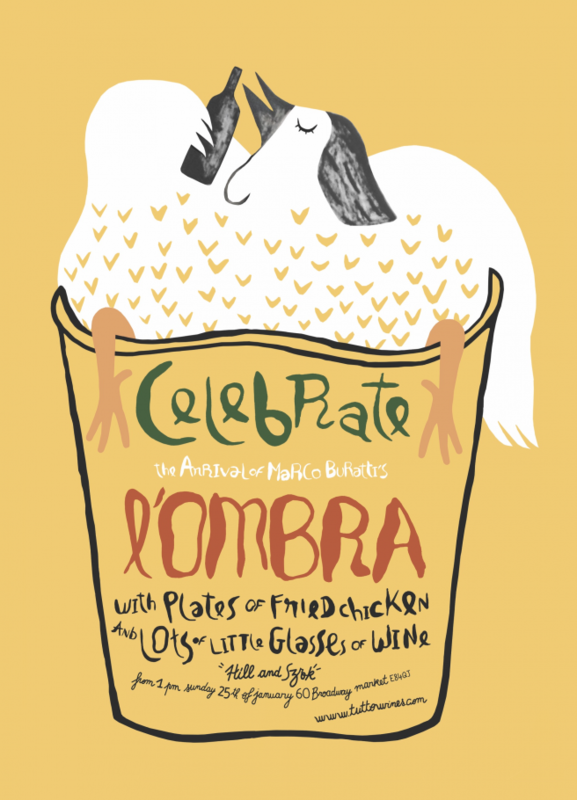 To celebrate the arrival of Marco and his new wine, the 2014 L’Ombra, on Sunday 25th January we are throwing a party at Hill & Szrok on Broadway Market. L’Ombra is Marco’s true wine of thirst, a blend of grapes macerated carbonically for five days it is of watermelon hue, brimming the energy of youth and bottled by the litre, though a litre is barely enough. From 1pm until late you can enjoy Marco’s wine by the ombra (a small measure, served in a tumbler, Venetian-style) alongside plates of pollo fritto cooked by Marco and local boy Pascal just like they have been doing for years at Al Sasso, the Colli Eugenei’s legendary trattoria that specialises in the dish. There is no need to book, simply rug up, get out of the house and down to the butcher for what promises to be a hell of a party. A few days later on Tuesday 27th January from 7pm, Marco will be hanging out at the bar at P.Franco in Clapton, pouring a selection of his wines and chatting about his farm Farnea, the Colli Eugenei, its grapes, landscapes and his unique style of winemaking. A selection of Marco’s wines will be available by-the-glass at Tuesday-appropriate prices, alongside the wonderful salumi and cheese we’ve come to expect from the bar. The might be the last chance to try his Birbo 2013, alongside the excellent L’Arietta and of course, L’Ombra. If the last event we did with ‘Gabrio’ here is anything to go by, this should be about as much fun as you can have on a school night.